Quite often allergies are overlooked when it comes to children. Many times parents just think their child has a cold, or a virus they picked up from school, or simply they are just overactive causing their child to have a runny nose. They are no set ways to determine if your child may have an allergy, but there are warning signs, and symptoms that you can watch out for when it comes to your child. Spotting an allergy in a child is a tricky process. So many childhood illnesses are similar when it comes to allergy symptoms. What makes it more difficult is that the Childs environment is very broad. Children generally spend time outside, inside, at school, in the home, or anywhere the child may travel. This is a lot of area to cover and makes it not so easy to spot an allergy in your child… On top of all the environmental allergies, there are certain food allergies that are prevalent in children. A normal cold will just last a few days but if you child has prolonged cold symptoms it may an allergy. There are other possible symptoms to watch out for besides the cold like symptoms. Not all children will have them but some show signs of having an allergy. Coughing or wheezing is very common, and should be a red flag for a possible allergy. Children with allergies often look pale if they have allergies, and there are studies that show smaller children may be at a greater risk. A darkening around the eyes and a tired look may also be an allergy symptom. This may be because of congestion behind the eyes caused by an allergy. All children tend to run their noses. A child with a possible allergy may do it excessively. If they use their palm of their hand in an up ward motion, may be a sign of a congestion problem caused by an allergy. Watch for patches of dry skin on their bodies. The most common areas for dry, rough skin, allergy related are the cheeks, arms and chest, but other areas may also have rough skin. Any signs of hives are a huge symptom and should be addressed immediately. Hives are associated with a possible peanut allergy and can be severe if left untreated. There are also some things children to look out for other then physical symptoms. Many children pretend not to hear a parent when they are being told do something they don’t want to do. But some children who have certain allergies do have a hearing loss when it comes to a congestion problem. Watch out for a poor attention span too. 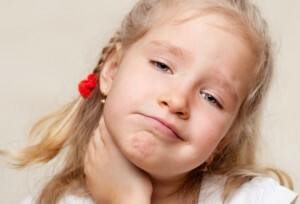 Sometimes the child is unable to concentrate comfortably because of their allergy. Sometimes children will make funny faces or have facial tics because of a nasal allergy. Of course children will make funny faces just because they are kids, but watch for facial expressions that don’t seem to fit a pattern, as in playing with other kids and goofing around. Ask a teacher or other parent to watch for this type of behavior in your child.